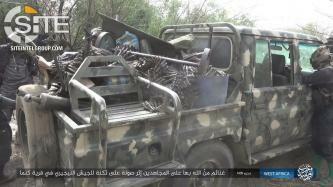 The Nigeria-based Islamic State (IS) division, West Africa Province, published photo of a Nigerian soldier taken hostage and ammunition and vehicles captured as war spoils following a clash in the Lake Chad area. 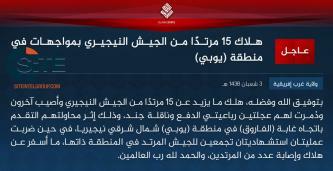 In an “exclusive” in Naba 114, the Islamic State (IS) reported that its West Africa Province carried out a suicide bombing on Nigerian soldiers in the Lake Chad area, killing and wounding dozens. West Africa Province, the Nigeria-based division of the Islamic State (IS) comprised of former "Boko Haram" fighters, published a photo report on its raid on Nigerian army barracks in the town of Kanama in Borno State. 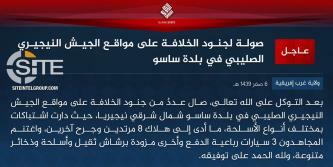 West Africa Province, the Nigeria-based division of the Islamic State (IS) comprised of former "Boko Haram" fighter, claimed killing nine Nigerian soldiers in a raid on their barracks in Borno. 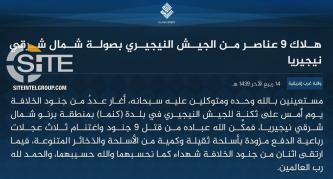 The Islamic State's (IS) 'Amaq News Agency reported that nine Nigerian soldiers were killed in an attack by IS fighters on their barracks in Borno State in northeastern Nigeria. 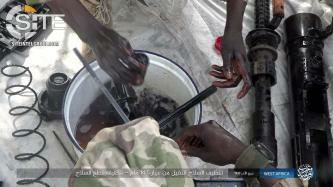 West Africa Province, the Nigeria-based Islamic State (IS) division comprised of former "Boko Haram" fighters, published a photo report on cleaning a heavy machine gun and loading its bullets. 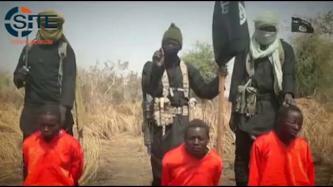 The Islamic State's (IS) West Africa Province, which is comprised of former “Boko Haram” fighters, claimed killing eight Nigerian soldiers and capturing four vehicles after a raid on their position in Yobe State in northeastern Nigeria. The Islamic State's (IS) 'Amaq News Agency reported that fighters in Nigeria seized vehicles, one of them carrying a heavy machinegun, in Yobe State. 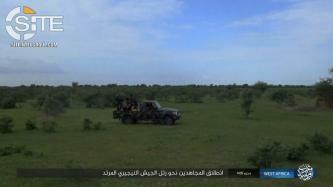 In its first report on military activity in three months, the Nigeria-based division of the Islamic State (IS), West Africa Province, published photos of ambushing what it described as a Nigerian army convoy. 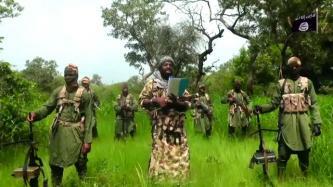 Abu Bakr Shekau, the leader of Jama’at Ahl al-Sunnah Lil Dawa Wal Jihad ("Boko Haram”) declared to leaders of West African governments in a video speech that the Islamic State (IS) will remain in the region, and under his local command. Boko Haram released a video showing three oil exploration contractors, abducted in a raid in northeastern Nigeria on July 25, 2017. The Islamic State’s (IS) West Africa Province, which is comprised of former “Boko Haram” fighters, claimed killing 12 Nigerian soldiers in an attack in Yobe. The Islamic State’s (IS) West Africa Province, which is comprised of former “Boko Haram” fighters, claimed credit for two suicide bombings on Nigerian forces in the northeast of the country, and alleged to have killed 15 soldiers in a clash in the same area. 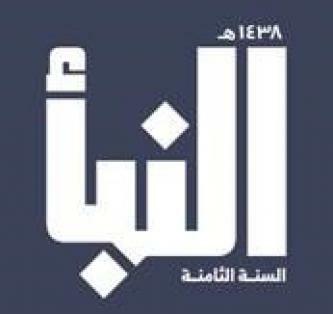 The Islamic State (IS) released an audio speech from its spokesman, Abu al-Hassan al-Muhajir, rallying the groups fighters in all its “provinces” and especially Iraq and Syria, and challenged America as well as calling on lone wolves in the U.S., Europe, and Russia to “preoccupy” the enemy and attack their interests. 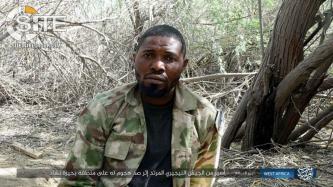 The Islamic State's (IS) 'Amaq News Agency reported killing two Nigerian soldiers and wounding others in an ambush in Borno. 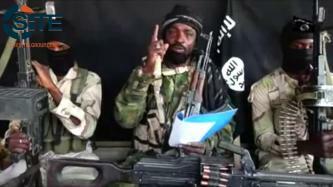 Abu Bakr Shekau, the leader of Jama’at Ahl al-Sunnah Lil Dawa Wal Jihad ("Boko Haram"), insisted in his latest video appearance that he remains the leader of the Islamic State’s (IS) West Africa Province. 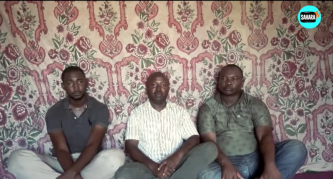 Jama’at Ahl al-Sunnah Lil Dawa Wal Jihad, or what is known as “Boko Haram,” released a video of executing three spies, two by gunshot and one by beheading. 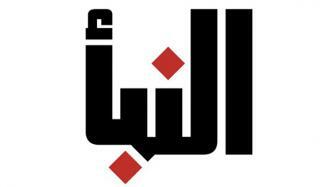 The Islamic State’s (IS) ‘Amaq News Agency reported attacks by the group’s divisions in Nigeria and the Philippines. 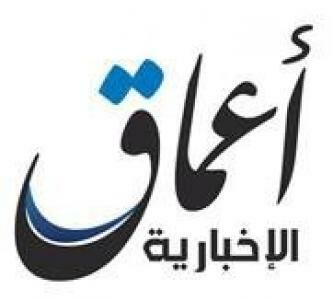 ‘Amaq posted both Arabic reports on its Telegram channel on March 7, 2017. 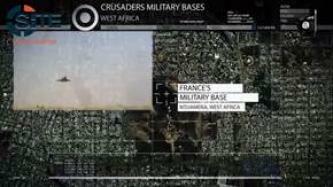 West Africa Province, the Nigeria-based division of the Islamic State (IS) which is comprised of former "Boko Haram" fighters, released a video showing clashes with African coalition forces in the Lake Chad and Farouq Forest areas, and identifying “Crusader” military bases in the region.